Students from 51 schools across the ACT will no longer have a dedicated bus service dropping them at school. File photo. The Canberra Liberals have spoken out about their fears for the safety of Canberra school kids after the ACT Government revealed that 51 schools will be left without a dedicated school bus services under the new bus network. Following a backlash from parents and schools about the proposed bus route changes and the loss of most of the dedicated school bus services, the ACT Government adjusted its plans for the new network, releasing the new plans on Tuesday morning (16 October). After receiving 13,000 pieces of feedback regarding the proposed bus service, the new network, which is set to remain in place for the next five years, now includes an additional 78 dedicated school bus services. 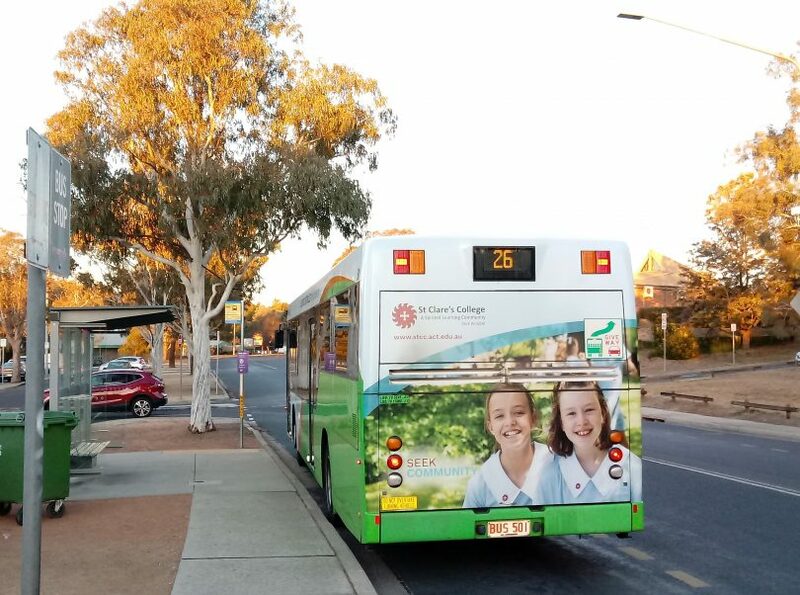 While students from 51 schools across the ACT will not have a dedicated bus service dropping them at school, Minister for Transport Meegan Fitzharris said the new network would provide a better mix of dedicated school and regular buses, depending on the needs of local school communities. But Opposition transport spokesperson Candice Burch said she still has grave concerns about the safety of school kids on public transport. 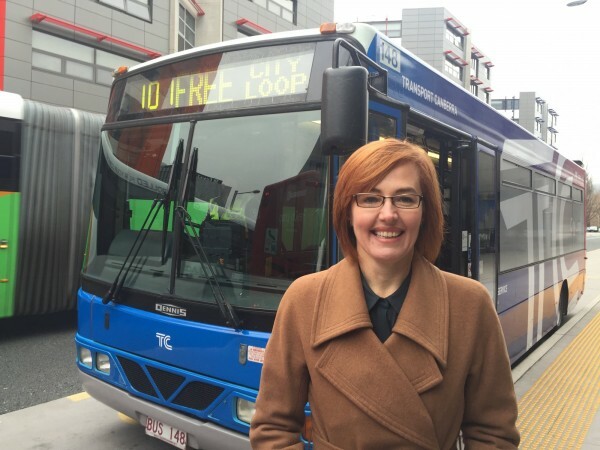 “The Canberra Liberals welcome the fact that the Government has backflipped on its radical bus overhaul and have reinstated 78 of the services they originally said they were going to cut,” Ms Burch told Region Media. Given the recent spate of child approaches across Canberra, with the number rising to 20 reported child approaches as of last week, Ms Burch said the Canberra community and the Liberal party are very concerned for school kids’ safety on their way to and from school. 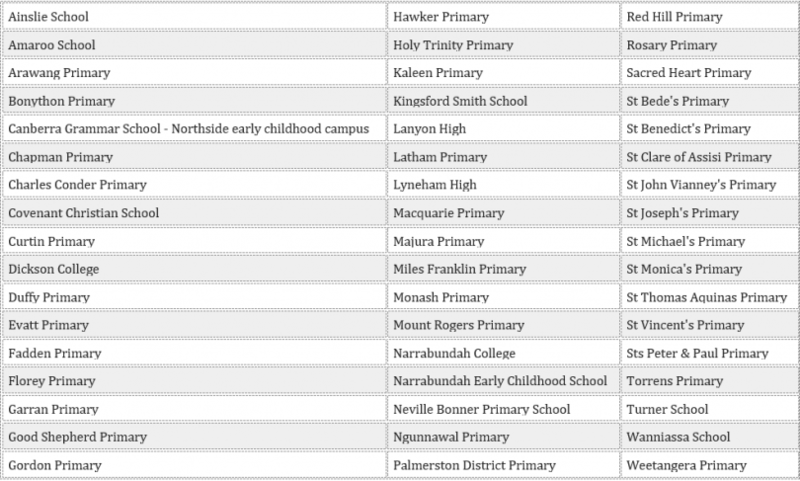 The 51 schools which will not have a dedicated bus service under the new bus network. Ms Burch said she has been inundated with complaints from parents, grandparents, teachers and concerned school principals about student safety. Some students will now rely on expanded local or nearby rapid services with the Government set to employ new customer service officers to familiarise school children with using interchanges. But Ms Burch said it will not stop parents from being concerned for their kids’ safety. “The Government is talking about adding one additional Customer Service Officer at interchanges, which is not nearly enough. It still means children are very vulnerable when they are walking to and from bus stops,” she said. “If students are on public buses with other members of the public, we can’t expect the bus driver to keep an eye out for what is happening at the back of the bus. Ms Fitzharris said most Canberra students don’t use public transport, with the majority of kids getting to school by car. Photo: Supplied. Ms Fitzharris said the new bus network had been designed to encourage more students to use public transport, give families greater choice and help offer students greater flexibility while getting them to school on time. Ms Fitzharris said the 51 schools which will not have dedicated bus services are primary, early childhood or infant schools which have very low bus patronage or high schools or colleges that are now well-served by regular route services. “We really want to encourage more students to catch public transport to and from school, and we have worked extensively over the past few months with schools and the education sector to deliver a balanced network that will encourage more students onto buses and light rail,” Ms Fitzharris said. “We know currently around 60 per cent of students who catch a bus to school use the regular network, so kids are very happy to catch regular buses, which are safe, flexible and easy to use. Ms Fitzharris said the number one priority of the new network would be helping students navigate the system safely. “We want students to be safe on our buses, which is why we will ensure there is more help and supervision at interchanges. We will employ more customer service officers and school crossing supervisors, improve the infrastructure around schools and provide better information to help people navigate the new network,” she said. And Belconnen misses out yet again. The school bus that travels to the South side is scrapped. So that now pushes kids onto 2 or 3 buses. It will push me and others onto the already clogged roads. Damm you transport Canberra. Leave the services alone just as they are. It's working now. Just change some 300 expresso trips to work in with the light rail.Not happy at all my 161 route may get canned. The government needs to make Light Rail look better than the buses. One way of doing this is to reduce the attractiveness of the buses by reducing services. The ACTION fleet is smaller than it was in 1989 despite the dramatic increase in population. Getting rid of school buses is another way of dealing with the shortage of buses.